From the CD IC 720.171 Dancing Fantasy "Moonlight Reflections". My copy has both sides of the disc labeled with Side B, Moonlight Reflections. However, the disc contains the songs mentioned on the cover. Anyone else who has the same? 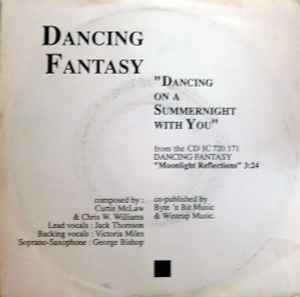 PSA: this 7" has the vocal version of "Dancing On A Summernight With You", not the instrumental one that plays in the youtube clip. The Side B of the 7" is simply a superb song!